I’m actually having a real hard time putting together this Waiting on Wednesday right now, for you see, all want to do is flail my face all over my keyboard. Mere words cannot describe my excitement. And also, Like a River Glorious? 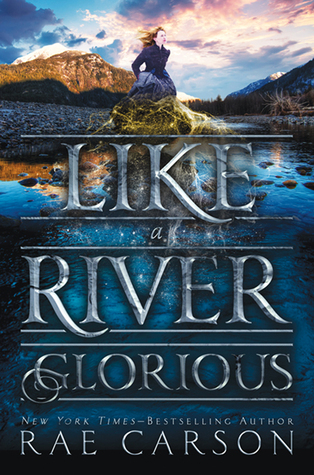 Like a cover glorious, more like! Just beautiful. “After a harrowing journey across the country, Leah Westfall and her friends have finally arrived in California and are ready to make their fortunes in the Gold Rush. Lee has a special advantage over the other new arrivals in California—she has the ability to sense gold, a secret known only by her handsome best friend Jefferson and her murdering uncle Hiram. Oh yes this cover is so gorgeous!!! This cover is freaking stunning. I still need to check out the first book from the library, though. But honestly, all the blue and the stone-like typography is giving me life. You must you must! I have to say the covers have been phenomenal so far. Nailed both the first and second book. OOh nice! Love these covers! Haven’t read this author yet but hear good things! Not sure if this is my type of fantasy, but there is no arguing that the cover is GORGEOUS! The art is stunning, but whoever chose the font (did the cover design?) deserves just as much credit. I agree, it’s so striking. The mountains in the background and the depth of the river and oh the absolute blueness of it. Oh my goodness… That just took my breath away. Yes! I knew I wouldn’t be alone in showcasing this book this week:-) That cover is just stunning, and I’m excited to find out what happens, now that the gang is in California. That cover is as gorgeous as the first book; which I still need to read. Great pick! I have yet to dive into my copy of the first one – seriously, I MUST get to it soon. This cover is STUNNING. WOW! I’ve heard great things about the first one too so I can’t wait to get caught up too so I can properly FLAIL with you!! I hope you get a chance to read it soon! I’ve been waiting for this cover for ages and it’s more beautiful than I could have imagined! Wonderful cover indeed, and the story looks like something new and fresh in the genre: it will be interesting (to say the least…) to see how it develops. that cover is rather gorgeous and I just love the colours. I’ve not got on board with this one but I think perhaps I’ll have to make a note of it. Sounds good and all that flailing around has got to be encouraging methinks.